id you know you can turn acrylic paint into a permanent, washable medium for decorating cloth with the addition of one magical ingredient called Textile Medium. You can find it near the acrylic paint in any craft/art store. I sometimes dilute the paint/textile medium mixture with a little more water than I would for a painting on canvas, to get it to soak into the fabric like a nice watercolor wash. Follow the directions listed on the container of Textile Medium to mix it and then heat-set it. 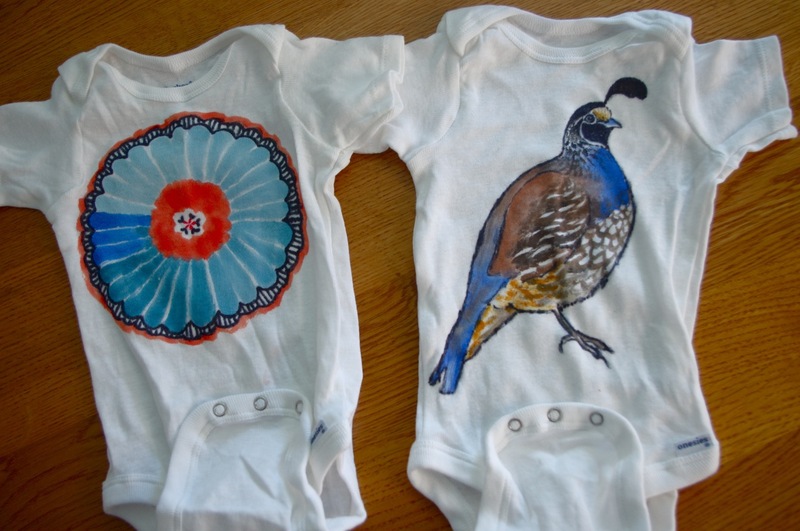 I also used permanent Sharpies on these onesies I decorated today for an expecting friend.